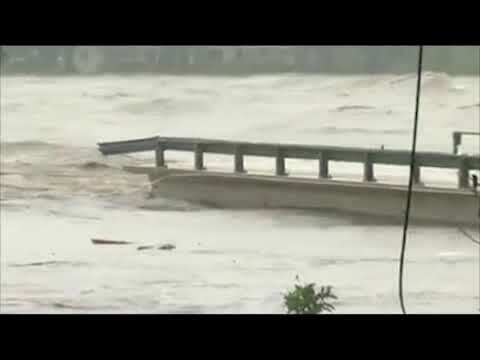 PORTLAND, Tenn. (AP) — A bridge has collapsed in Tennessee leading officials to close the road leading to it. MIAMI (AP) — Florida International University plans a moment of silence to mark the one-year anniversary of the collapse of a pedestrian bridge that killed six people. MIAMI (AP) — The contractor that built a pedestrian bridge that collapsed and killed six people last year in Miami is filing for bankruptcy protection. OLA, Ark. 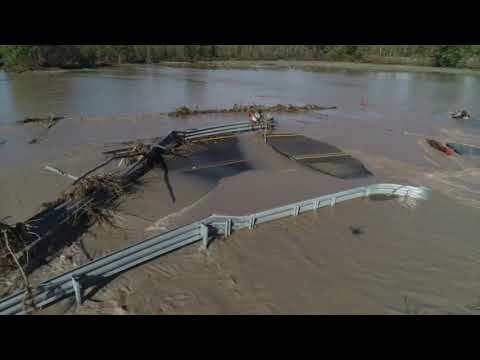 (AP) — Officials believe a trucker hauling frozen chickens was lost and relying on GPS when he drove across a rural Arkansas bridge and caused the nearly 90-year-old span to collapse into a river. Jeff Gilkey, with the Yell County Office of Emergency Management , said Friday that the driver wasn't hurt but was cited for violating bridge weight standards. DETROIT (AP) — A pedestrian bridge that once was part of a Packard auto assembly plant has collapsed, leaving a pile of rubble on a Detroit boulevard. MOSCOW (AP) — The mayor of Moscow has fired the director of the city's renowned Gorky Park after 13 people were injured when a wooden pedestrian bridge packed with New Year's celebrants collapsed. Video on Russian television showed a section of the bridge collapsing early Tuesday as the national anthem played on loudspeakers, marking the beginning of 2019. The park in central Moscow is a popular gathering place for the New Year's Eve holiday. POINT PLEASANT, W.Va. (AP) — A mural has been painted on an Ohio River community's floodwall in West Virginia in remembrance of a highway bridge collapse that killed 46 people. News outlets report Jesse Corlis painted the mural in Point Pleasant depicting where the Silver Bridge crossed the Ohio River along U.S. Route 35. The bridge fell into the frigid river on Dec. 15, 1967. The mural shows two cars passing over the bridge with a sunset backdrop and 46 geese flying over the river. HURLEY, S.D. (AP) — A bridge collapse has injured three construction workers in southeastern South Dakota. Turner County Sheriff Steven Luke says the workers were pouring concrete into rebar on top of the bridge southwest of Hurley when a support bar collapsed around noon Wednesday. Luke says the workers' injuries are not believed to be life-threatening. MOSCOW (AP) — A motorway bridge over the Trans-Siberian Railway has collapsed, injuring a truck driver and nearly missing a train that was passing underneath. Russian officials said the driver of a truck who was crossing the bridge as it collapsed on Tuesday was hospitalized with injuries. They said the accident happened in the city of Svobodny in Russia's far-eastern Amur region, near the border with China. PEARL, Miss. (AP) — Heavy rain in Mississippi has caused flash flooding that has inundated about 100 homes and 25 businesses. The flooding happened Wednesday in Pearl, just east of Jackson. Gov. Phil Bryant says in addition to buildings, more than 50 vehicles were damaged. Rankin County Sheriff Bryan Bailey tells local news outlets that 30 to 40 deputies helped rescue people. Pearl police say at least one bridge collapsed and a strip mall's roof fell in. 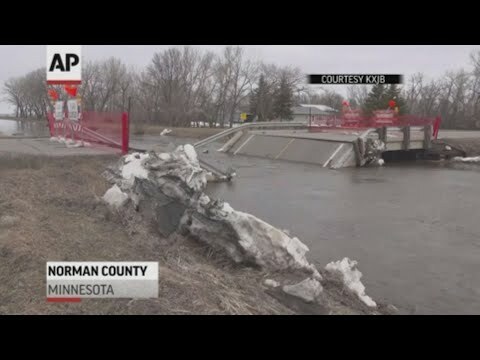 ALTON, Iowa (AP) — Cleanup efforts are underway after a bridge collapse in northwest Iowa caused a train to derail into the flooded Floyd River. 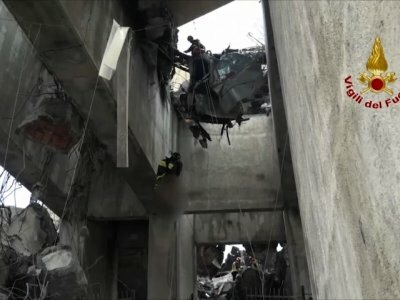 President Emmanuel Macron's government had already promised new infrastructure spending, but is coming under new pressure after Tuesday's bridge collapse in neighboring Italy that killed 43 people. 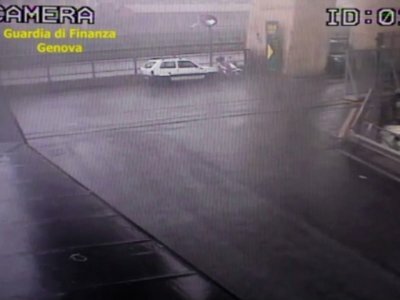 ROME (AP) — The two soccer teams from Genoa had their weekend matches postponed on Thursday following the bridge collapse in the Italian city. At least 39 people were killed in the collapse. The rescheduled dates for the two matches will be announced "in the coming days." 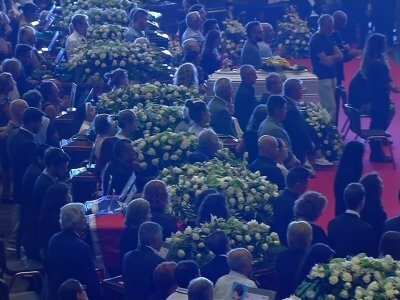 ROME (AP) — A partial list of the 39 people who died in the collapse of the Genoa highway bridge on Tuesday. Italian officials have released the names of 21 citizens whose identities have been confirmed and families informed. 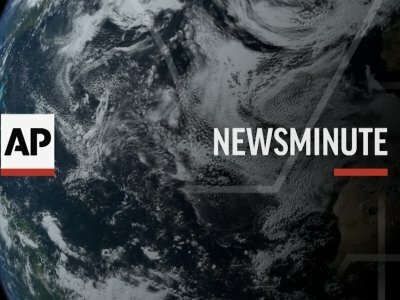 Four French citizens and two Albanians also were confirmed dead. NEW DELHI (AP) — Torrential monsoon rains have disrupted air and train services in the southern Indian state of Kerala, where flooding, landslides and bridge collapses have killed at least 67 people in the past week, officials said Wednesday.